I don't know about anyone else, but I hate seeing all the construction taking place on this island. 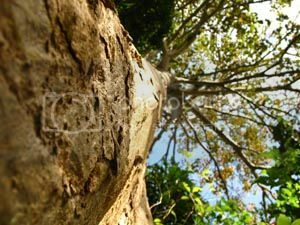 The irony of rampant 'construction' being so destructive to the environment ... A friend told me stories she had heard about the fate of the wild animals during the clearing of 1,500 acres of forest in south (for the controversial aluminium smelter). Apparently the clearing of the land had started from outside in, thereby literally impounding the animals in the centre, making it difficult for them to escape. Humans subsequently captured and slaughtered them to eat (wild meat). Apparently trucks were driving off dripping the blood from the carcasses of these poor beings. Words cannot convey the horror I felt upon hearing this. Think of the tsunami ... and the fact that in the face of such a massive disaster, animals' sixth sense had warned them of the coming wave - enabling them to escape to higher ground. This is why no animal carcasses were found amidst the debris of human bodies and rubble. However, in the case of a massive disaster like men coming with tractors and bulldozers to demolish an entire forest, populated with age-old trees/homes for countless living organisms ... does an animal's sixth sense work for that? I don't think so. No animal's sixth sense can alert it to the fact that there are money-hungry politicians and businessmen sitting around tables rubbing their hands and discussing the land they're going to clear so that they can erect a controversial smelter that no-one (but they) wants. 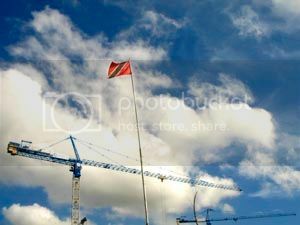 A crane and a flag, shot yesterday from Phase II panyard, next door to where they are building #1 Woodbrook Place. I took this shot because I feel the crane is flying high like the new symbol of T & T.
The day I heard that story about the wild animals, I called Detta Buch recipient of the first Happy Hippy Annual Hero's Award. Where do these animals go when their habitats are pillaged by man? This is why someone like Detta is important and why I sincerely hope that her work will be recognized and financially supported on a consistent basis. As the only person in TT who rehabilitates injured and orphaned wild animals, she has a monumental job on her hands. Her organisation: WORC is run virtually singlehandedly. Her latest patient is Lady, a pelican with one wing (the other is amputated). The people who brought her in to Detta had found her with another pelican, which was dead. The dead pelican was hanging by a rope around its neck from a tree. According to Detta: "And it was not suicide ..." It was humans, who apparently kill pelicans to eat. Is this necessary? The one-winged Lady can never be returned to the wild, so she will remain with Detta as an educational bird (for children in schools, etc.) As she is unable to catch her own fish, Detta has to go daily in search of sardines (Joshua) or other small fish for her to eat. This requires money ... as does purchasing a deep freeze in which enough fish can be stored (so that those daily fish searches are not necessary). If anyone is interested in helping to raise funds for this worthy cause, do not hesitate. You may also be willing to donate cash ... or give of your time as a volunteer (details and Detta's contact information can be found on the WORC site). Thank you. I am currently organising a photography exhibition with a friend of mine in order to raise funds for WORC. We have so far gathered about 10 photographers (both amateur and pro) - each of whom will submit maximum 2 photos, preferably around wildlife or nature themes. All money from sales will go to WORC. I'll keep you posted as to when and where this will take place. Interesting comment about the sixth sense of wild animals. About that tsunami, in addition to wild animals, another group managed to survive. They are the hunter gatherer tribal peoples who live in the Andaman islands in the Bay of Bengal. Relying on their knowledge of the movement of wind, sea, and birds, they had the good sense to heed the warning signs and head for the safety of high ground. Apart from others who might also have been aware but were trapped, the rest with their noses to the various grindstones of civilization were too domesticated or busy to see or read the signs. Everything came together like pure magic in this composition…the message, the rhythm, the melody, the voice, the delivery, but especially the love behind the sorrow about the state in which we find ourselves. King Austin, I continue to bow low and reverently.